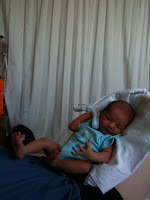 This week Kien passed 2 milestones; on Tuesday he turned 4 weeks old and today he is one month old. 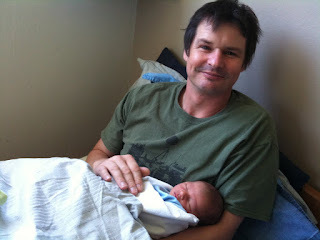 He was weighed by the midwife Liz Harding on Wednesday and he was 3900 grams, or 8 pounds 9 ounces. 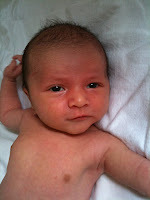 He has been going through a growth spurt in the last week and feeding every 1 1/2 - 2 hours. He averages 800 millilitres of mother's milk per day! He has been a bit colicky as well, which has been distressing for his parents. He has spent a couple of nights sleeping with me because we cannot settle him. 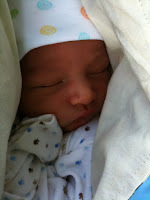 However last night was good since he did not suffer too much, and was able to sleep in his cot - thank goodness. I get so worried I might squish him when he is sleeping with me. This photo was taken during one of the many burping missions. 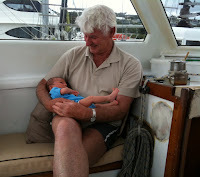 Yesterday we took Kien to visit his granddad and Margaret on their yacht. He was very willing to be passed back and forth, and managed to stay awake for most of the time. 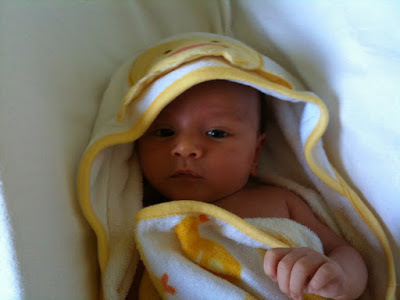 We gave Kien a bath prior to the outing. He has no qualms with being bathed; in fact he is completely calm and still, as evidenced in the clip. Have you ever been vomited, urinated and defecated on, all at the same time? I can't believe such a small human can manage to projectile poo so far! Of course I am invariably in the flight path, trying to change an already overflowing nappy. These pictures were taken right after I got him clean. Look at that cheeky face! Wow, I can't believe how fast 3 weeks has gone by. 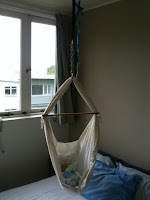 We are now into our forth week and Kien slept in his cot last night. I decided it was about time I weened myself off from having him sleep next to me in the bed. I am finding it a difficult transition indeed! At this stage he is supposed to nap for a good part of the day. However Kien does not abide by this principle. He is far too interested in what is going on around him, and will lie there for ages staring any which way. He will then start grizzling if I have left him for too long. So I compromise by carrying him around in a sling so I can continue getting stuff done, and he seems to enjoy the stimulation. Last Wednesday when I had the interview with the "Growing up in New Zealand" survey woman one of the question was how long I intended to feed him breast milk for. My answer is for as long as possible, preferably 2 years. It will be interesting to see how I will manage this when I go back to work! 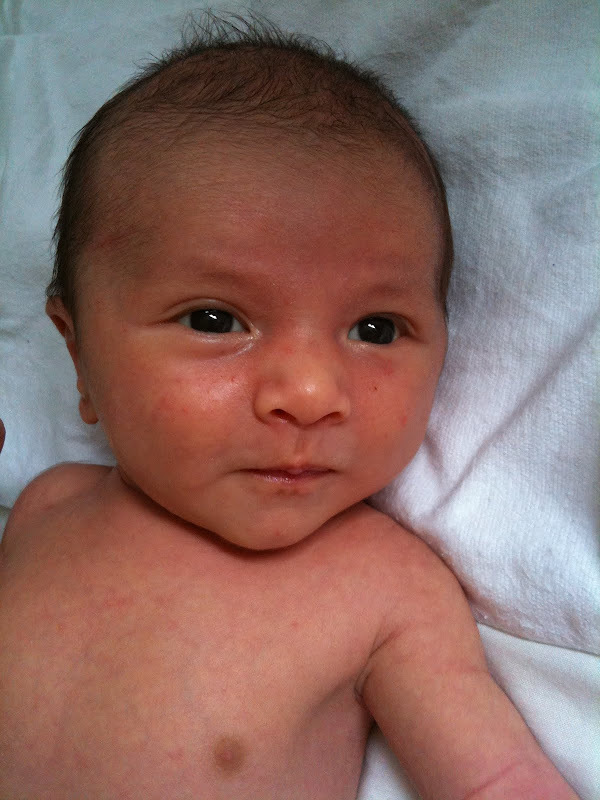 Kien is such a little piglet - he certainly enjoys his feeds and averages 80 mls every 2 1/2 - 3 hours easily. During the nights he gets 100 mls so he can last the whole 3 hours before his next feed, allowing me to have a little bit more sleep! 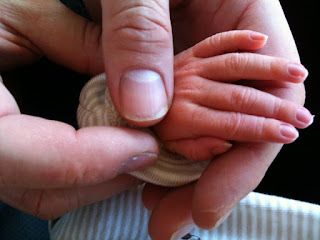 Today the midwife came to see us and weigh him. He is now 3320 grams, or 7 pounds 5 ounces. I guess we don't need to worry about his lack of weight gain any longer. He has made up for that outside of the womb quite nicely indeed. We have had a few visitors coming through, and it has been nice. On Sunday we had Mum, Rod and Sandra come over in the early afternoon. 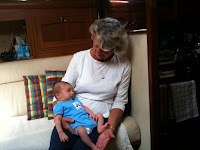 Kien was very content being held by Grandma. Later that day we went over to see Linda, Jason and Flynn and had dinner at their place. 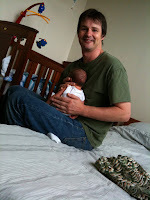 It was our first social visit, and we did not travel lightly - yet I still managed to forget a change mat and wet wipes. It was a good experiment none the less on what are the essentials to pack. Yesterday I took Kien out for a stroll for the first time. It was great to get out into the sunshine. He was wide eyed and curious while I pushed him through Western Park and half way down Ponsonby Road. Then he slept for the rest of the time. I'm sure Jef appreciated some rest while we were out. He has all this week off on paternity leave and has been running around after Kien and I the whole time. I think he can't wait to be back at his regular work! Yesterday the baby weighed in at 2.700kg, 5.76% loss from birth weight. Midwife was pleased with that result since the average is 10%. 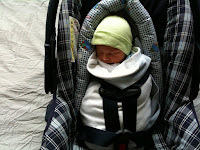 We bundled him up in his car seat, checked out of Birthcare in the morning and brought Kien home. It was really nice to come home. Jef has done an exceptional job of tidying and cleaning. I was so grateful. 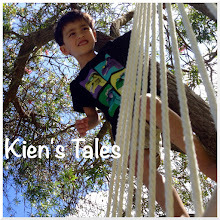 It was Jef's turn for some serious bonding with Kien, and they spent hours together. I got a chance to get settled.